Island Hammer LLC Hammer of Poulsbo is a full service general contractor specializing in remodeling, repairs, and renovations. We have several resources to keep current with material and labor costs for your home or business, ensuring you are receiving the best service at the best price. The personal attention we give to each construction project is a reflection of our efficient and responsible project management practices that deliver consistent results each time. This ultimately leads to reliable scheduling and budget control, which are both valued in our process to serve you. We maintain an extensive list of licensed, bonded, and insured professional sub-contractors that are available to provide service in all areas of construction. Each sub-contractor must file the proper licensing and insurance certificates with our office prior to being added to our list of certified providers. These sub-contractors respond promptly to our calls and deliver the same quality service that our clients expect. Our home remodeling company also works with several associate companies that contribute their supplies, offer us projects to take on, and provide valuable resources for our team and community. 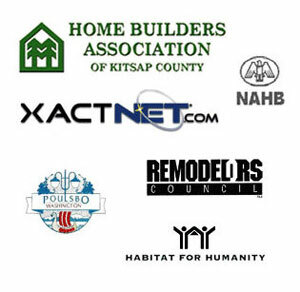 These include the Home Builders Association of Kitsap County, NAHB, XACTNET.com, Remodelors Council, the city of Poulsbo, Washington, and Habitat for Humanity. We are also a civic supporter of Viking Fest, Share-net, N. Kitsap Babe Ruth Baseball, and NKHS Athletics, all of which we sponsor or contribute to in support of their endeavors.